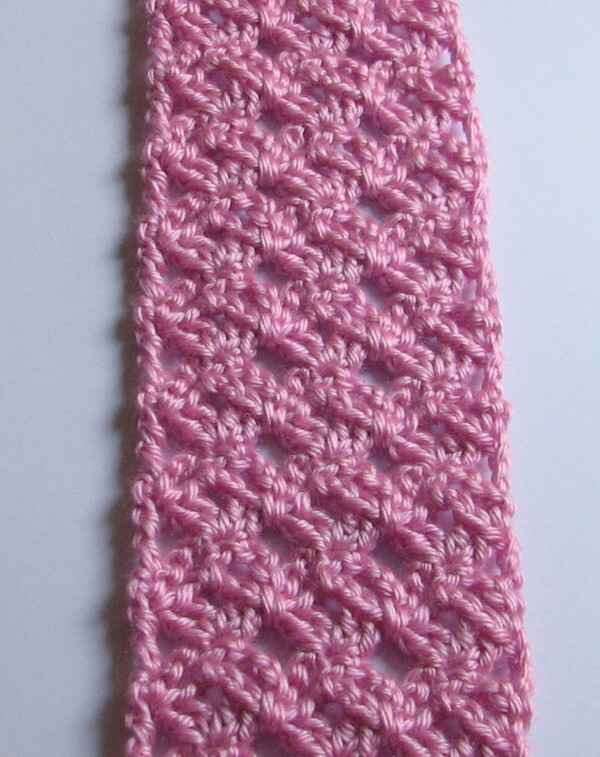 I’m not really sure what the ‘proper’ name for this stitch is, but it reminds me of latticework, so that’s what I’m calling it :). If someone out there actually knows the name of it, feel free to chime in. chain any multiple of 6 plus 3. Row 1: (2dc, ch2, 2dc) in 6th ch from hook, *skip next 5 dc, (2dc, ch2, 2dc) in next ch, repeat from * across to last 3 ch, skip next 2 ch, dc in last ch, turn. Row 2: ch1, sc in 1st dc, *ch3, dc in next ch2 space, ch3, skip next 2 dc, sc btwn last dc of the 2 you just skipped and next dc, repeat from * across, end with last sc in top of turning ch, turn. Row 3: ch4 (counts as tr), skip next ch3 space, (2dc, ch2, 2dc) in next dc, *skip next 2 ch3 spaces, (2dc, ch2, 2dc) in next dc, repeat from * across to last ch3 space, skip next ch3 space, tr in last sc, turn. Repeat rows 2 & 3 for pattern. >Just thought I'd say hi. I found and started following your blog last week. Crochet is my new found love and I'm enjoying all your inspiration! >I'm going to have to try that one – it looks lovely! Thanks for the instructions. >I recently started reading your blog. I am grateful for your tutorials, because I like to learn new crochet stitches. I would like to ask if you could also suggest what are appropriate uses for the stitches you teach. Thank you. >Anna,That's actually a really good idea. I will try to do that from now on. Also would like to say, I do love your patterns…. I don’t have any video tutorials. I could probably work on a photo tutorial if you think that would be helpful. Unfortunately I don’t have a tutorial but I might be able to do one in the next week or so.